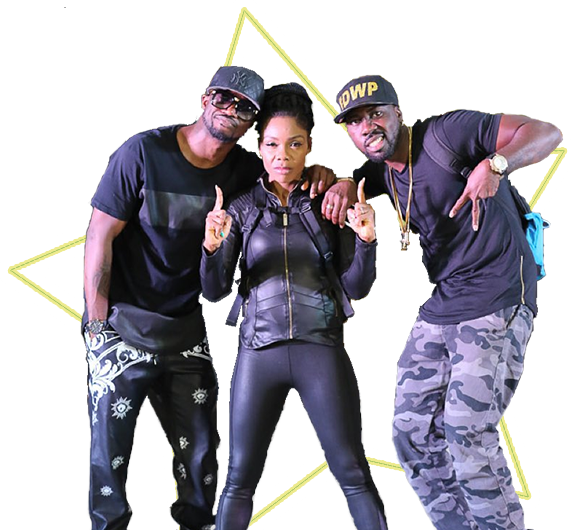 Peter Psquare is a member of the group Psquare, A dynamic singing and dancing duo who have raised the bars of music and choreography in Nigeria since their introduction into the Nigerian music industry. Peter and his twin brother, Paul started early while growing up in Jos in their Catholic Secondary school, and was highly influenced by Mc hammer, Michael Jackson and Bobby Brown. He is an award winning dancer, singer and has performed with a number of international acts such as Akon, Rick Ross, T.I amongst others. They have won several international awards and have performed in several continents and have a huge fan base across the globe. They have consistently fused dancing as a major part of their musical repertoire and their music videos are loved for the dance moves as much as the singing. And live performance and shows are even more intriguing. Kaffy was born in Nigeria but grew up in London and Canada, New York and Egypt (see waka!!). She completed her primary education at Chrisland School, Opebi and her secondary school education at Coker Secondary School, Orile-Iganmu before attending Yaba College of Technology for a while and went on to obtain a diploma in data processing from Olabisi Onabanjo University. In a niche of her own she is definitely the ”go to” lady for dance and choreography in a usually male dominated industry she has made a name for herself and age and motherhood doesn’t seem to slow her down, still strong energetic and stamina levels still as sharp as ever due to dedication and hard work. She has worked with A list musicians such as Psquare, Dbanj, Sheyi Shay and won the award in 2014 at the African Muzik Magazine Awards as best female Dancer of the year. (Who dem wan give?). She was also a judge in Malta Guiness street dance. Don Flex, a Choreographer with the Dance duo Psquare. He is so good he called himself “Don” anyways, his parents thought otherwise. Little did their know their son they named, Asobe Nonso Cajetan would be known internationally as Don Flex, they probably would have saved him the trouble and cut right to the chase. As most talent groups, they always start from church. He started manifesting his talent at the age of 13 with the group IGNYTE, which won a talent show competition in his church. He has mentioned in several interviews that he was influenced by Hip hop and RnB during his formative years and they have greatly influenced his dance moves. Unlike most people including, Dancing is a talent that he has explored, developed and improved over years due to diligence, right living and dedication. He is a crop of emerging Nigerian entertainers making waves for themselves in trades that previous generations would have considered unprofitable, but with dedication and belief he has become a leading dancer and choreographer. He was at the 2006 Rhythm Unplugged, where he met Psquare and was given a date to audition. He impressed the duo and he was accepted into their crew and he became their chief choreographer a year later. Ehizojia Okoeguale - aka Ehiz aka Superslim, aka MTV VJ, aka fine boy, aka iamrunningoutofnicknames- is the Host of the Maiden Edition of Dance With Peter reality TV show, He hails from Edo state but was born in Lagos. Ehis, a very charismatic individual and the last child of 5 siblings, is a graduate of computer Science from Lead City University. He has always been a good friend of the stage, hosting social nights and school events. He won the MTN VJ search in 2013. He's passion for his job has not only seen him win the Job but also grow in strides and making a mark in the entertainment industry. Hosting the popular MTV base countdown show, he has interviewed a host of popular musicians with a no dull moment interview. He has earmarked himself as one of the hottest and sought after presenters in Nigeria at the moment. Obianuju Catherine Udeh, popularly known as DJ Switch is the official DJ for Dance with Peter. She is a graduate of the University of Port Harcourt with a B.SC in Geology. Switch who is a native of Udi in Enugu State emerged winner (with her band, Da pulse) of the Star Quest music talent show in 2009 with the hit single ‘pray Sote’ featuring Busta Rhymes. In 2013, she was crowned winner of Glo X-Factor music talent show, West Africa. She is great at what she does and always gets so much love from her audience. Switch became official DJ for 2face in 2015 and is currently official DJ for Hennessy, Belvedere, Moet and Chandon.